According to Reuters, the FBI and other agencies were still looking at evidence inside the club and on the closed-off streets around the Pulse nightclub, where New York-born Omar Mateen perpetrated the worst mass shooting in modern U.S. history. Mateen, 29, the son of Afghan immigrants, was shot and killed by police who stormed the club with armored cars early on Sunday morning after a three-hour siege. The gunman, Omar Mateen, 29, of Fort Pierce, Florida, was interviewed by the FBI in 2013 and 2014 but was not found to be a threat, the FBI said. Mateen carried an assault rifle and a pistol into the packed Pulse club about 2 a.m. Sunday and started shooting, killing 49 people and wounding at least 53, officials said. However, it has been revealed that Mateen called 911 during the attack to pledge allegiance to ISIS and mentioned the Boston Marathon bombers, according to a U.S. official. Now, at the direction of Franklin Graham, crisis-trained chaplains with the Billy Graham Rapid Response Team have deployed to Orlando following the terror attack on the Pulse nightclub. According to a news release, the Billy Graham Rapid Response Team will come alongside local churches in offering emotional and spiritual care to the many who were affected by the attack, from those who were in the club at the time of the shooting to residents of the greater Orlando community. “We grieve for the victims, for the families who lost loved ones, and for the survivors who will carry physical and emotional scars for the rest of their lives following this horrific attack,” said Jack Munday, international director of the Billy Graham Rapid Response Team. The response in Orlando marks the ministry’s fifth deployment in the last nine months related to shootings or terror attacks. Crisis-trained chaplains have worked in Roseburg, Ore. (Umpqua Community College), and San Bernardino, Calif., domestically, and in Paris, France, and Brussels, Belgium, internationally. Other notable Billy Graham Rapid Response Team deployments related to shootings include Virginia Tech (2007), Northern Illinois University (2008), Aurora, Colo. (2012), and Newtown, Conn. (2012). For more information, please contact: Erik Ogren, (704) 401-2117, eogren@bgea.org. Dr. Jerry A. Johnson, President & CEO of the National Religious Broadcasters, said, “The membership of the National Religious Broadcasters and I are heartbroken by the massacre that took the lives of at least 50 Americans yesterday in Orlando. Every person slain was an image-bearer of God, worthy of dignity and respect. We weep with those whose friends or family members have been taken from them, for those who have been injured, and for families who will never be the same. Gordon Robertson, CEO of the Christian Broadcasting Network (CBN), said, “Today, we mourn the deaths of innocent Americans who were murdered by an Islamic terrorist in the Pulse nightclub in Orlando. 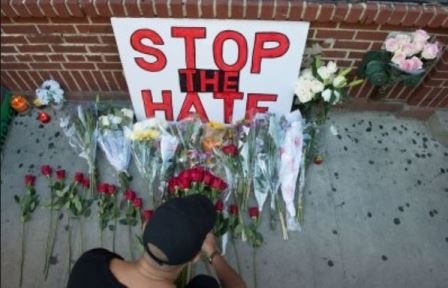 The attack appears to be well planned and specifically targeted against the gay community. There is no justification for this terrible act of violence. The NRB contact is: Contact: James A. Smith Sr., Phone: 202-999-8714, Email: jsmith@nrb.org. Photo caption: 1) Orlando police after the deadly shooting. 2) Mass killer, Omar Mateen, on Social Media. 3) Billy Graham Rapid Response team member brings comfort at a previous deployment. 4) Franklin and Billy Graham. 5) Couple hold signs. 5) Norma and Dan Wooding in Hollywood during a reporting assignment for ANS. (Bryan Seltzer). 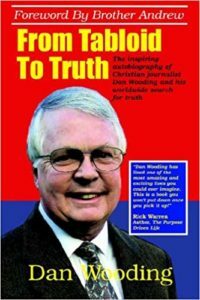 About the writer: Dan Wooding, 75, is an award-winning winning author, broadcaster and journalist who was born in Nigeria of British missionary parents, Alfred and Anne Wooding. He is now living in Southern California with his wife Norma, to whom he has been married for nearly 53 years. They have two sons, Andrew and Peter, and six grandchildren, who all live in the UK. Dan is the founder and international director of the ASSIST News Service (ANS), and the author or co-author of some 45 books, the latest is Mary My Story from Bethlehem to Calvary (http://marythebook.com). Dan has a weekly radio show and two TV programs all based in Southern California. Before moving to the US, Dan was a senior reporter with two of the UK’s largest circulation newspapers and was also an interviewer for BBC Radio One in London. ** You may republish this and any of our ANS stories with attribution to the ASSIST News Service (www.assistnews.net). Also, please tell your friends that they can have a complimentary subscription to the news service by going to this website.